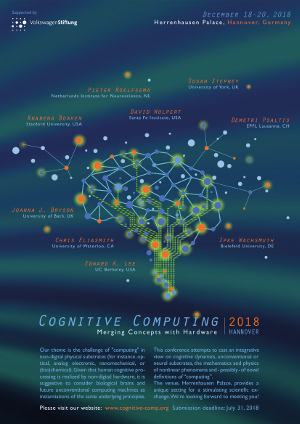 L. Gonon and J.-P. Ortega, "Reservoir computing universality with stochastic inputs", IEEE Transactions on Neural Networks and Learning Systems; To appear (2019). L. Grigoryeva and J.-P. Ortega "Universal discrete-time reservoir computers with stochastic inputs and linear readouts using non-homogeneours state-affine systems", Journal of Machine Learning Research, Vol.19, No. 24, pp. 1-40 (2018). Z. Zheng, S. Morando, M.-C. Péra, D. Hissel, L. Larger, R. Martinenghi and A. Baylon Fuentes, "Brain-inspired computational paradigm dedicated to fault diagnosis of PEM fuel cell stack". International Journal of Hydrogen Energy, vol. 42(8), pp. 5410 - 5425, 2017. doi: 10.1016/j.ijhydene.2016.11.043. B. A. Marquez, L. Larger, D. Brunner, Y. K. Chembo, and M. Jacquot, "Interaction between Liénard and Ikeda dynamics in a nonlinear electro-optical oscillator with delayed bandpass feedback", Physical Review E, Vol.94, No.6, 062208 (2016). doi: 10.1103/PhysRevE.94.062208. L. Grigoryeva, J. Henriques, L. Larger, and J.-P. Ortega "Nonlinear Memory Capacity of Parallel Time-Delay Reservoir Computers in the Processing of Multidimensional Signals", Neural Computations, 28, pp. 1411-1451 (2016). doi:10.1162/NECO_a_00845. Grigoryeva, L., Henriques, J., Larger, L., and Ortega, J.-P., "Time-delay reservoir computers and high-speed information processing capacity", Proceedings of the IEEE International Conference on Computational Science and Engineering, August 24-26, 2016 - Paris, France. doi:10.1109/CSE-EUC-DCABES.2016.230. N. Oliver, L. Larger and I. Fischer, "Consistency in experiments on multistable driven delay systems", Chaos, Vol. 26, 103115 (2016). doi: 10.1063/1.4966021. L. Grigoryeva, J. Henriques, L. Larger, and J.-P. Ortega "Optimal nonlinear information processing capacity in delay-based reservoir computers", Scientific Reports, 5, Article number: 12858 (2015). doi:10.1038/srep12858. S. Morando, M.-C. Pera, N. Yousfi Steiner, S. Jemei, D. Hissel, L. Larger, "Diagnostic de PEMFC à l'aide de réseaux de neurones à réservoir", GDR Hyspac 2017, Limoges (Mai 2017). J.-P. Ortega, "Time-delay reservoir computers and high-speed information processing capacity'', Computational and Methodological Statistics Conference (CMStatistics'16). Universidad de Sevilla, Spain, December 2016. J.-P. Ortega, "A reservoir computing approach to machine learning", Swiss Institute for Empirical Economic Research, Sankt Gallen, Switzerland, Breakfast Seminar, November 2016. B. Marquez, L. Larger, D. Brunner, Y.K. Chembo and M. Jacquot, "Interaction between Liénard and Ikeda dynamics in a nonlinear electro-optical oscillator with delayed feedback", Dynamics of Delay Equations, Theory and Applications in WIAS Berlin, Germany, Oct. 2016. S. Morando, M.-C. Pera, N. Steiner, S. Jemei, D. Hissel and L. Larger, "Fuel Cells fault diagnosis under dynamic load profile using Reservoir Computing", 13th IEEE Vehicle Power and Propulsion Conference (VPPC2016), 6 p., 17-20 October 2016, Hangzhou, China. B. Penkovsky, D. Brunner, L. Larger, “Towards a Brain-Inspired Computer With a Delay Dynamics” at GDR BioComp, INSA Lyon, October 11, 2016. J.-P. Ortega, "Time-delay reservoir computers and high-speed information processing capacity", Joint keynote address for the conferences: 19th IEEE International Conference on Computational Science and Engineering (CSE 2016), 15th International Symposium on Distributed Computing and Applications to Business, Engineering and Science (DCABES 2016), and 14th IEEE/IFIP International Conference on Embedded and Ubiquitous Computing (EUC 2016). 24-26 August 2016, Ecole des Mines. Paris, France. J.-P. Ortega, "Reservoir computing: a big data compatible machine learning paradigm", Workshop on Computational Social Science. Universität Konstanz, Germany, July 2016. B. Penkovsky, D. Brunner, L. Larger, “Toward New General-Purpose Processor With Nonlinear Transient Computing” at Dynamics Days Europe, Corfu, Greece, June 9, 2016. B. Marquez, L. Larger, D. Brunner, Y.K. Chembo and M. Jacquot, "Bifurcation of spiral-shaped patterns in the phase space of a nonlinear delayed electro-optic system", XXXVI Dynamics Days Europe, Corfu, Greece, June 9 2016. L. Grigoryeva, "Capacity of time-delay reservoir computers in the forecasting, filtering, reconstruction, and parallel processing of stochastic stationary and multidimensional signals", Workshop “Dynamical systems and brain-inspired information processing”. Besançon, France, November 3rd, 2015. J.-P. Ortega, "Time-delay reservoir computers: nonlinear stability of functional differential systems and optimal nonlinear information processing capacity", Conference ``Dynamical Systems and Brain-Inspired Information Processing''. Univ. Franche-Comté, Besançon, France, November 2015. J.-P. Ortega, "Time-delay reservoir computers: nonlinear stability of functional differential systems and optimal nonlinear information processing capacity”, Univ. of Calgary. Seminar of the Mathematics Department, Calgary, Canada, July 2015. L. Grigoryeva, "Volatility and time series forecasting with non-scalar parametric models and machine-learning based techniques", University of Konstanz, Konstanz, Germany, May 5, 2015. J.-P. Ortega, "Reservoir computing: optimal nonlinear information processing capacity, performance, and universality. Applications to stochastic nonlinear time series forecasting", European Centre for Advanced Research in Economics and Statistics (ECARES). Univ. Libre de Bruxelles, Belgium, February 2015. L. Grigoryeva, "Reservoir computing: optimal nonlinear information processing capacity, performance, and universality", Applications to stochastic nonlinear time series forecasting. Journée du Laboratoire de Mathématiques, Besançon, France, January 8, 2016.